Lawn care can either make or break the first impression your home gives to a prospective buyer. A maintained lawn will help justify your asking price while an overgrown yard with brown patches will discount your home. Many homeowners focus on updating the inside portions of their house and forget about the exterior. Preparing your yard and landscaping before your home goes on the market is essential. Check out these ways to prep your lawn in advance when selling your homethis year. Disease and fungiplague many Florida lawns. Make sure to address problem areas in the grass that could lower the price of your home. Brown and dead spots are not only ugly, but they also tell home buyers that you neglect your yard. Consider applying different fungicides to the lawn after you identify the problem. Rake out dead spots and overseed the area with new grass seed to fill in the lawn. Make sure your yard isn’t abreeding ground for mosquitoes. Tackling these problem areas is an integral part of preparing your yard for the busy home buying season. Feeding your lawn with added energy is a great way to green things up and boost curb appeal. Consider adding a quick release fertilizer to help brighten the yard and encourage grass growth. Sprinkle the lawn with granules or spray but be careful not to apply too much to one area as it could burn the lawn. Slow-release fertilizers are also an option if you want to feed the lawn continuously while your home is on the market. A word of warning: Florida has statewide Urban Turf Fertilizer Rulelimiting phosphorus and nitrogen fertilizer use. Some local agencies have imposed additional restrictions, including Hillsborough, Orange, Pinellas, Manatee, Martin, Indian Riverand Lakecounties, most commonly with a summertime ban on phosphorus and nitrogen fertilizer applications. Contact yourFlorida Extension Service officefor information about your locale. Mowing your lawn on a regular schedule is a great way to make sure it’s always in top condition before a showing. Not only does a mowed and edged lawn look updated but it also adds to the overall appeal. Mowed lawns may go unnoticed, but we guarantee that a neglected yard will draw attention. Booking a lawn service can help take the stress out of selling your home by maintaining the yard on a regular schedule. 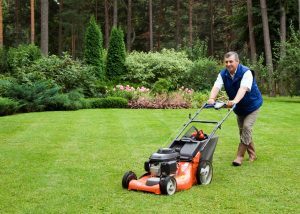 At an average of $35 per mowin Tampa, a lawn service can quickly pay for itself by saving you time, effort, and stress. This is the most dreaded outdoor chore, but weeds will put a definite damper on a home tour. Tackle the most prominent weeds along the main walkways and around transition zones of the yard. Get the kids involved and spend an afternoon removing unsightly crabgrass. Consider adding aweed control productto the grass to help reduce the reappearance of weeds. Knowing when to water your lawn is as important as watering the grass. Florida’s climate is often humid meaning your yard is always surrounded by a lot of moisture. Make sure to water your lawn in the morning after the sun has risen but before 10 am. This allows the grass to soak in as much water as possible before the heat of the day. Watering at night is a big no-no since it allows your soggy lawn to sit overnight and makes it a breeding ground for disease and fungi. Give your yard a deep soak about 1-2 times per week to encourage strong and deep root growth. Selling your home in the Tampa area can be easy with the right amount of prep work before your house goes on the market. Preparing your lawn in advance is an excellent way to stay ahead of the busy selling season and making sure that your home looks stunning from the curb.